Some of you may have wondered “what happened to me” as there has been nothing posted in a while from me. Yeah I am still around, enjoying some spring weather in Canada interspersed with some more winter and have just finished what is known as Lent. So what is Lent anyways? It is taking these 40 days to prepare oneself for Easter. On the outside things do not look any different. I can’t escape and hide out in a cave. I still have work, family and church commitments. But inwardly you try to change. One of the ways is giving up something significant during those 40 days. And what may be significant for one person might mean mothing to another. My wife gave up sugar in her tea and coffee, and it was HUGE for her, but for myself who does not add sugar in my hot beverages, cutting out sugar would not mean anything. This year I gave up blogging on my running blog. No new posts and probably read just a handful of posts…VERY unusual for me, and it was really tough. And I have missed you. The one thing I DID do is take some of that freed up time to register a new domain that ties in with my Sunday lay pastoring. It is called mysundayblog.com. It is like a little devotional that ties in with the Sunday morning message at church. The cool thing is that it really is not much more work for me, as I already write this devotional for our church Facebook page and our church group e-mail anyways. But having the blog domain allows to do so much more. Makes me wonder why I kept putting this off for so long. As a lay pastor not only do I prepare myself during the 40 days of Lent as I journey towards Easter but also guide the congregation through Lent to help them prepare for Easter. 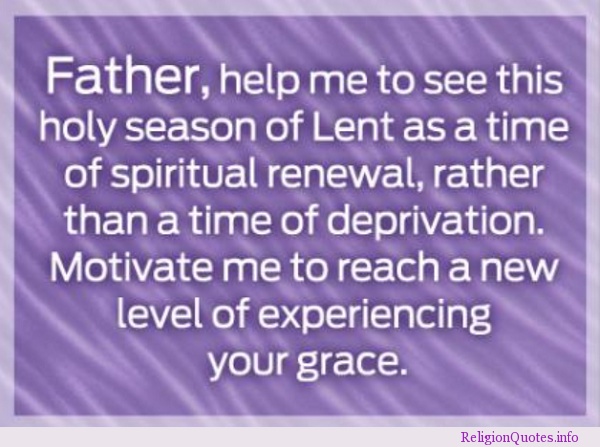 Each week we do pray this prayer, “Father, help me to see this holy season of Lent as a time of spiritual renewal, rather than a time of deprivation. Motivate me to reach a new level of experiencing your grace”. It is always exciting to hear of people giving up bad habits during Lent, and when it is all over often they don’t ever want to go back to former habits. Always so cool. 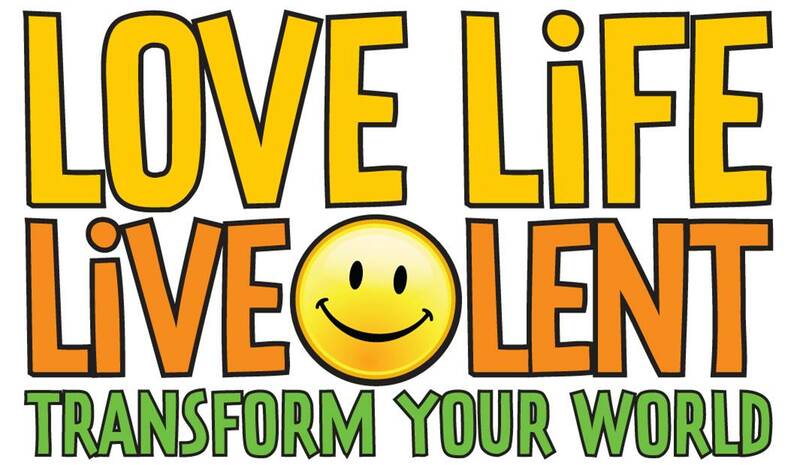 Did anyone else give up something for Lent that they would like to share? My Return to the Berry Patch. Happy to read your words again. 🙂 Happy Easter to you and your family. Smiles! Hope the spring season is treating you well Carl! 🙂 Best wishes. Happy Easter! Lovely to see you back. I was focusing on #4 on your list of 40 this year, especially with my aging parents. It’s so easy to get frustrated, but I kept reminding myself of the endless patience they had (have) for me throughout my life. 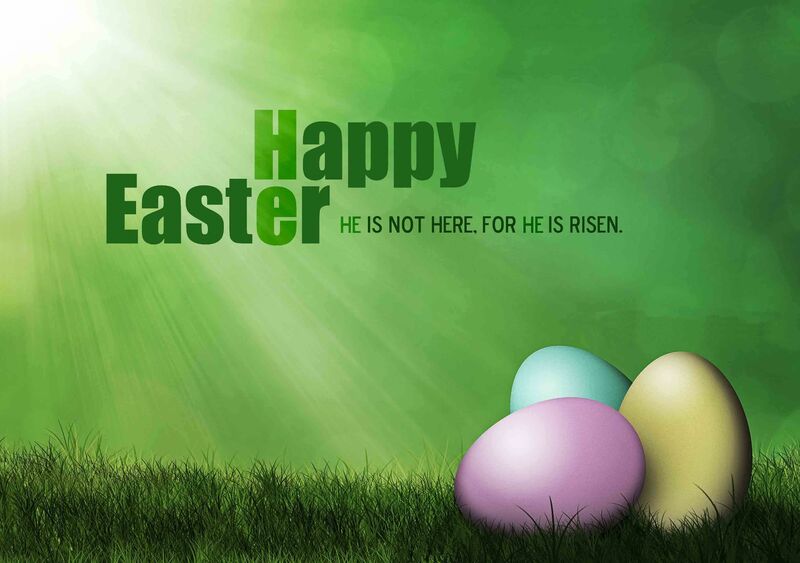 I hope you and your family have a blessed Easter! Thank you for sharing with such honesty Denise, and I commend you so much for working through these feelings. I struggled through these very feelings when my own mom was living and had failing health. Now that she has passed away there are some times I wished I has shown a bit more patience. I so agree, with my mom she had so much patience with me over the years. I did, I did! So happy to see you and Happy Easter! Crazy 💛! Have a great day! Happy Easter and good to see you back online. Happy Belated Easter! Glad to have you back. I don’t really celebrate Lent. I did try to give up something but Lent like New Year’s Resolutions never works for me. As for church I only go on Palm Sunday and Easter. I might return to the church I went to yesterday. To tell the truth I Love reading the Bible, I say my prayers but don’t have much use for organized religion. I suppose for me at this late stage in my life too much water has passed under the bridge. Also given my personality I’d just be a hypocrite warming a pew. When I was younger I had a greater commitment to the church but with a heavy duty work schedule and trying to be a caregiver to my brother Stephen who has Autism church no longer figures in my life. Anyway churches don’t provide any services or programs for struggling caregivers. Just like military Veterans of which I am one developmentally disabled citizens and caregivers are forgotten. Deborah Ann, thank you so much for sharing such a detailed and honest from the heart reply. One thing I always admire about you is your transparency and honesty. Sometimes “organized religion” is such a contradiction from the teachings of Jesus in the Bible. You are not the 1st one who has told me this. As a lay minister I struggle as much as anyone. With working full time, plus family commitments and church responsibilities I am often at the edge of burnout. Sometimes I feel I have nothing more to give, yet God ALWAYS provides the strength I need. As much as our small church tries to meet the needs in the community (we are the only remaining church in the community) people do fall through the cracks. I struggle so much with this. I struggle with my inadequacies. Having a college diploma in Social Service Work sometimes I am able to make referrals. It is not the most the most ideal thing, for a person to go to the local church only to be referred to an agency in a neighboring city. But so often their training, specialization and experience far exceeds what we can offer. Not a “cop out”. It is just reality. The most important thing they get the help and support needed, but I do really feel bad that the church was not the one able to provide it. You will also find every church is different. Even though one church is not able to provide the support you require, perhaps another church might. Despite having a seating capacity of 170, most Sundays we only have 15-20 people, mostly who are elderly. I love these people so deeply. Those who do attend do find the support and belonging here. The church was established in 1851, came close to closing 4 years ago and is slowly growing. We don’t have the resources and people to launch the programs I would like to see, and many people want but we do what we can with the strength God gives us. Sometimes people in my very own community will go to the bigger churches in the cities that has the programs they are seeking. I am very happy that there needs are being met. So often I feel my little rural church has so little to offer. But then over this Easter weekend, a very well known and lifetime resident died. He was a fairly young 66. The funeral was today at the church and the church was packed. Everything was at the church starting with the visitation, the funeral and then the luncheon. It did my heart so much good to be a part of today. Not only was there “paying respect”, but I saw SO much caring and compassion. Having that opportunity for community people to have closure and to come together to grieve in the presence of this caring community and in a sense to give one another permission to experience the loss. It was a time to celebrate this life and remember. And the family was SO appreciative. During the luncheon the mostly elderly church ladies were like worker bees, working almost until they were about to drop to make sure everything was provided for family and friends of the deceased. The interesting thing Deborah Ann is that the family does not attend our church. But being here as part of the community where this gentleman lived his life, there was a connection to have the service right here in this community. It just felt like the right thing for the family to have the service here. The funeral was today, and to be honest, I am completely drained. Yet I am encouraged. My prayer is that you too will be encouraged. This cannot be easy for you as caregiver for your dear brother Stephen. I had been praying, but with Lent and staying off the blog I have slipped and must get back to praying for your situation. Happy Easter and nice to see you’re back!! Thank you so much for dropping by Indah and your kind words, you always make my day. Lent definitely is not easy. Maybe with the significance of it, I do better though than keeping a New Year’s resolution. So excited about the new blog domain! I”m headed over to check it out. I love to see fellow writers using their talents to serve the Lord, and that’s exactly what you do as a pastor and a blogger. Thank you for sharing with us!! Thank you so much for your encouraging words, for stopping by, and your kind follow! Well I was wondering why you hadn’t popped up in my reader so glad to hear you are back. I look forward to checking out that other site too, it sounds inspiring! Why did you choose to give up blogging? How do you feel after the gap? Was there something else you had considered instead of this? I know… Too many questions. Few of my Christian friends were observing Lent and I was seriously unconvinced about this whole “giving up” thing. I hope you don’t take offense – I am just trying to understand. I mean, to give up pastries for 40 days and lose weight did not seem very Easter and gratitude type? No offense at all my friend. It is SO important to ask questions when you are not so sure on something. And it means a lot you are comfortable asking these questions. I guess Prajakta with Lent it is a personal thing, and there very well could some taking part for the wrong motives. For me I stepped away from my blog because of the way it was eating up way to much of my time. There is work commitments, family commitments, church commitments, I run and I blog. I allot myself an hour a day for blogging, and love reading other people’s blogs and encouraging others, which is a good thing, but one hour became 2 hours, and sometimes even 3 hours some days. It was becoming a bit of an addiction and was eating into my other commitments which was bothering me. I tried to cut back on my own, but it was not working, so for the period of Lent I decided this is it. I am completely giving this blogging thing up.. And with God’s strength I was able to do it. Being a personal thing normally a person does not broadcast to the world “hey look what I gave up for Lent” No one knew that I had specifically given up blogging, not even my wife and kids. At church I would explain Lent, but also mention that it is a very personal thing, and people could choose whether or not they participated in Lent.. No where in the Bible does it say that a person has to do Lent. 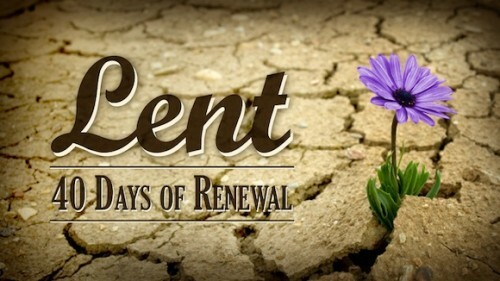 A person who does Lent does not make him or her more “better, Christian or spiritual” than anyone else. A person should never feel guilty if he or she does not do Lent. But during that course of 40 days a couple of bloggers did message me asking what happened to me, thinking I was sick or unwell. I normally don’t share my Christian faith on my running blog, but wrote the post at the end more to explain to my blog followers my absence. Personally, those 40 days away from blogging was very helpful. It allowed me to get my priorities back in order. More time reading the Bible, more time for prayer. More time for family, church sermon preparation and I was able to make some needed visits to people who were hurting. I had been procrastinating because I did not think I had the time. Some bonuses Lent also freed up some time to launch the other blog (thank you for the follow). Also I was able to do some long overdue decluttering, and get rid of some “stuff” I no longer needed, and donate it to charity for people who could use it. It was very freeing. Even though I am lay pastor, I might explain Lent in church but I may not personally do Lent myself most years, otherwise I would be doing it for the wrong intentions and motives. For me not doing Lent is better than feeling obligated and ending up “giving up” something lame. 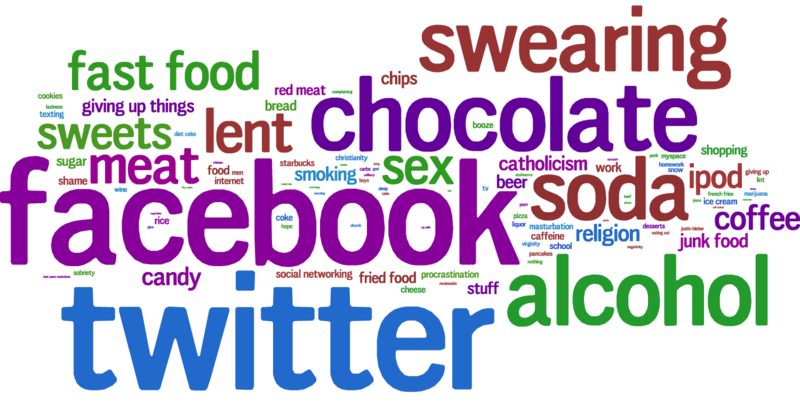 There has actually only 2 times I have ever done Lent, both times involved personal addictions. Both times the discipline of Lent got me back on the right track. I am once again able to walk away from the computer after an hour of blogging, and it is a wonderful feeling. My life has more balance which I am very grateful for. Prajakta, I appreciate you so much as a blogger friend. You were my most active commentator last year. This is HUGE! I appreciate this SO much. It means a lot to me that you felt comfortable asking these questions. Lent can be very hard to understand, but I hope this answers some of your questions. Thanks a lot for making me understand the intricacies of this concept and the choices it leaves us with. It helps me resonate the reason you decided to let go of blogging for this time – it was a very fruitful cleanse that eventually makes you a better blogger without compromising on your real life. And unannounced decisions are the best – always been an advocate. Ahhh, Prajakta I am very touched by your kind comment and for your honesty.